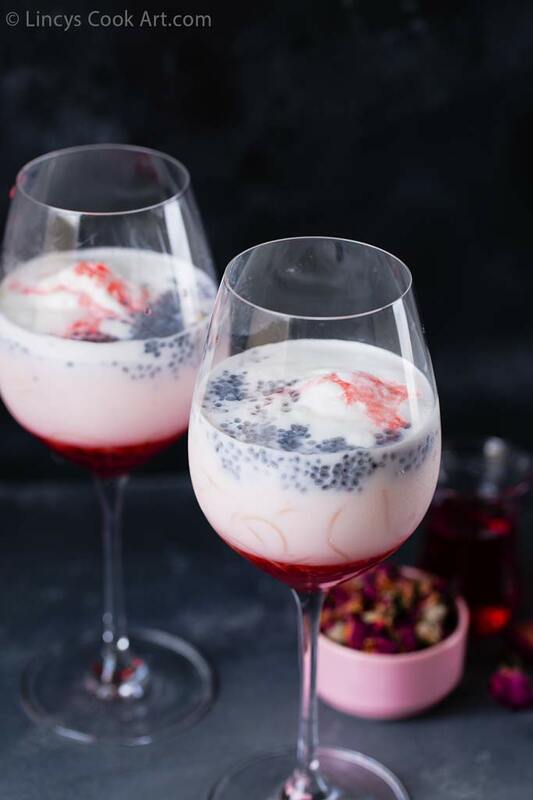 Rose Falooda is a tasty quick to make filling summer drink especially for the summer. Perfect for any occasions like parties or gatherings quick to make and a delightful drink. Last week I had prepared and shared Mango Falooda recipe with you. Last year when it was the strawberry season we had the strawberry falooda. 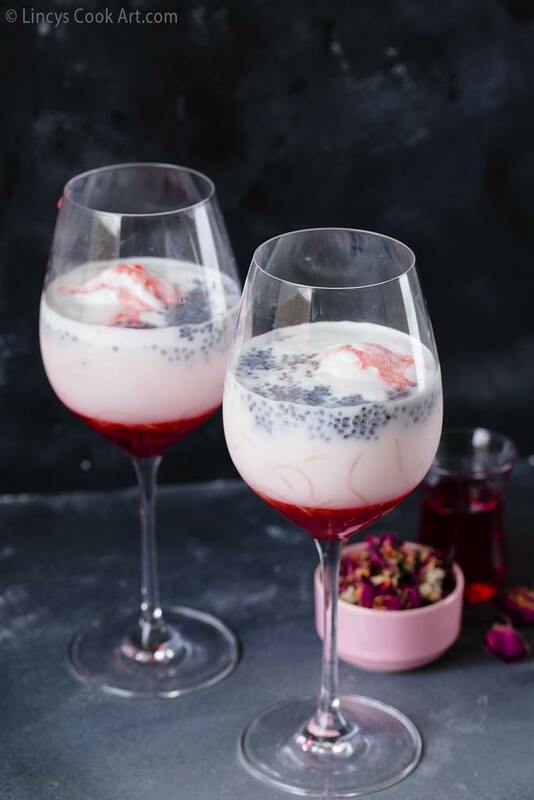 Here comes the Rose falooda nowadays rose syrup is available in every mall and supermarket so you could buy and prepare this yummy drink. Or make the rose sugar syrup by adding the rose essence or rose water and red food colour. Boil the milk; once it starts to boil reduce the flame and allow to simmer for 10 minutes. Then switch off and allow to cool; once it reaches the room temperature transfer on to a jug and allow to cool. Take 3 cups of water and boil inside a deep pan. Once it starts to boil add the vermicelli and allow to cook till soft. Now drain the excess water and allow to cool. Soak the sabja seeds in half a cup of water for 10 minutes and drain the excess water. To assemble in a glass add the rose syrup in a tall glass and then add the cooked vermicelli and pour the milk over it. Mix it with spoon if you like at this stage. 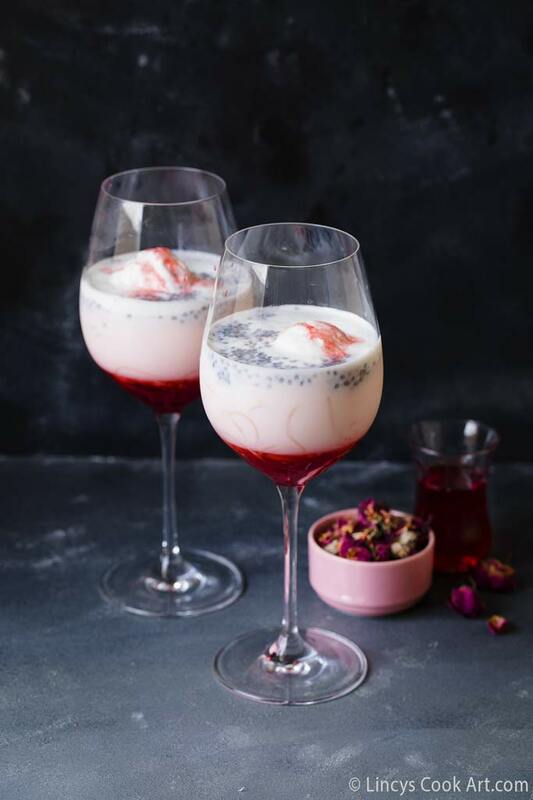 Add the soaked sabja seeds on top of falooda and top it with a scoop of vanilla icecream. 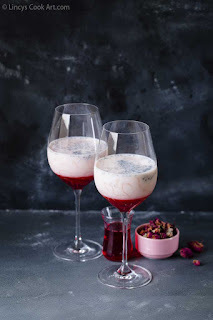 You could prepare this drink another way by adding sugar and red food colour while boiling the milk and then adding the rose water or essence once the milk cools down and then follow the above steps. 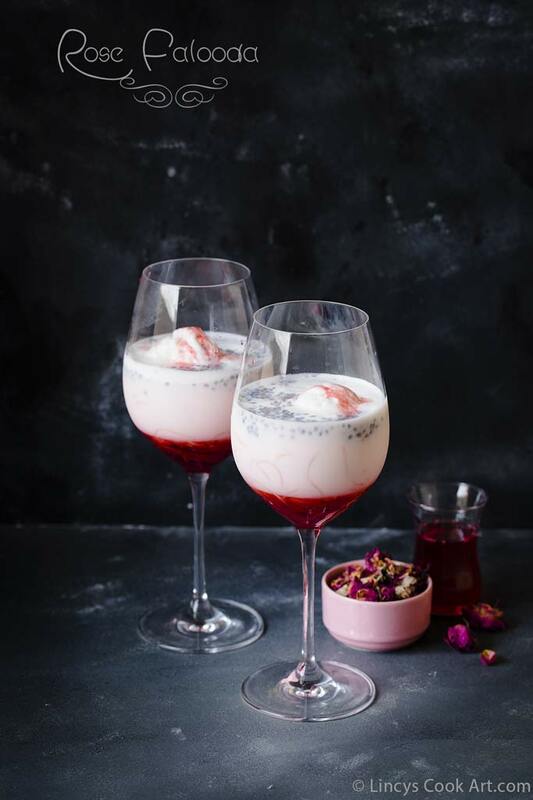 You could boil some water and add some gelatine and rose syrup and set set it inside the freezer for some time and cut the jelly and add with this yummy falooda.